Site visits to CODOS study plots at Grand Mesa on June 7, Swamp Angel Study Plot (SASP) on June 9, and Wolf Creek on June 10, revealed snow-all-gone (SAG) at all locations. As the photos shown below illustrate, snow is either totally gone (Wolf Cr.) or exists only in thin, patchy areas. Snow is mostly present in heavily treed areas and higher elevations, and predominately on northerly aspects. All dust layers are merged at the surface of the snow. Just like the other CODOS sites with dust, an “all-layers-merged” (ALM) sample was collected at each of these locations and sent to our USGS collaborators for chemical analyses for inter-site comparison. May was cooler than normal state-wide. Here at Senator Beck Basin (SBB), SASP, and even more so Senator Beck Study Plot (SBSP) located at 12,180’, saw a boost in precipitation from three storms the first half of May along with an overall period of slowed snowmelt. The last 10 days of May, after precipitation events ceased (besides a brief precipitation event on May 26 effectively creating an “albedo reset”), the snowpack began melting rapidly with increasing rising minimum and maximum temperatures. Nighttime minimum air temperatures began to stay above 0° C on June 2. In response, stream discharge starting the end of May surged to a record peak at the SBB gauge. The gauge reached 20 cfs on June 5. The water year with the next highest daily peak is WY2010 at 18 cfs. 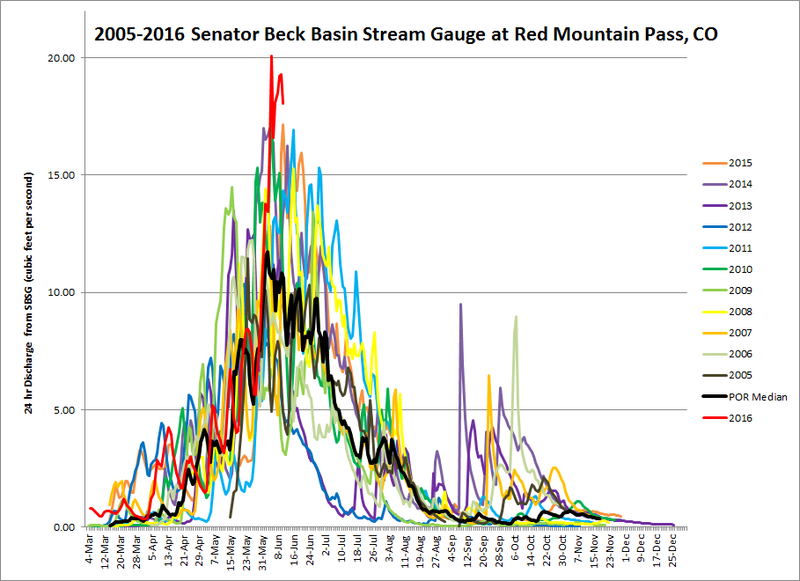 Similarly, stream gauges around the state are showing the same jump in streamflow. Please see plots below. Over the last 7-days the SBB stream gauge measured daily record peaks in discharge, with the maximum peak being 20 cfs on June 5. The next highest peak was 18 cfs in WY2010. Most of May was cooler than normal. May 1 (day of year 122) thru May 18 (DOY=139) we documented three storms at SBB. The latter part of the month recorded one day with precipitation at SASP. The snowpack melted rapidly with the increasing temperatures and clear, sunny days. Snow depth was near average all season. SBSP experienced a bit more snow accumulation in May than SASP. In addition to simply being located at a higher elevation, merged dust layers were exposed later than at SASP due to “albedo resets” lasting longer at higher elevations, slowing snowmelt rates. That said, it appears SAG will occur before the average date of June 29. Snow-depth was average, or above average, all season. Photo looking towards SASP climate station (11,060’). All dust layers merged at surface of snowpack. Snow still present on some northerly aspects (left side of photo in foreground). Stream gauge at the outlet of SBB watershed. Daily stream discharge hit record peaks (max 20 cfs) over the last 7-days based on our 13 year dataset. Photo of SASP and climate station. Patchy snow still exists in and around SASP. Treed, northerly aspects and gulleys still retain snow. Photo of SASP snow profile sampling area on June 9 with climate station in foreground. Snow under SR50 snow-depth sensor is now depleted. Only a few inches of discontinuous snow remains in sample area. Grand Mesa Study Plot on June 7 with climate station on right side of picture. A few inches of snow is still present under SR50a snow-depth sensor seen on upper right corner of picture. Grand Mesa CODOS sample area on June 7. Photo shows where snow profiles are usually conducted. An all-layers-merged sample was collected in this area. Snow cover is sporadic in open clearings. Snow is largely present in heavily treed areas and more northerly aspects. Wolf Creek CODOS sample area. Photo looking in southwest direction. Wolf Creek Summit on June 10. Photo looking southeast. Northerly aspects at elevations approximately above 11,000' still predominately snow covered. Wolf Creek Summit. Looking south towards Wolf Creek Ski Area. Thin snow coverage remains in treed, mostly northerly aspects around 10,800’. Photo taken ~9,600’, below Wolf Creek Summit. Snowcover diminishes quickly below 10,500’. Below Wolf Creek Pass. Photo taken at 9,600’, looking southerly at 11,500’ peak. For the remainder of the snowmelt season the temperature outlook calls for increased chances for above average temperature for all of Colorado. Precipitation outlook calls for increased chances for below average precipitation for all but the most southerly portion of Colorado. Over the next 7-days precipitation totals are expected to be highest east of the Continental Divide. The Western Colorado forecast calls for 0.01”-0.25” precipitation for the coming week.